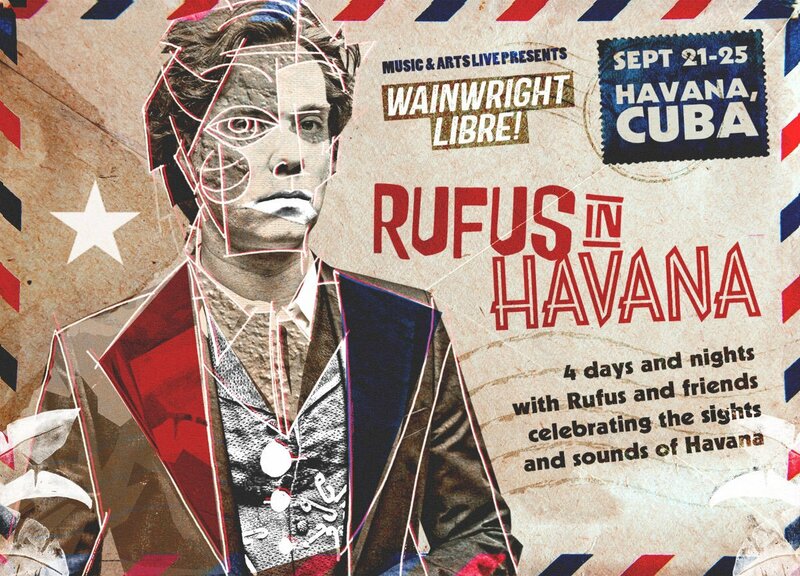 Rufus Wainwright is taking fans to Cuba for a four-day moveable feast of music and adventure. The one-of-a-kind experience — billed as “Wainwright Libre” — will take place in Havana from September 21- 25. The trip offers fine dining, sightseeing, dancing, educational workshops, private concerts, and more. Fans will stay at the chic Melia Miramar Hotel along the Havana coast. Wainwright will perform two shows for his guests in Cuba, one solo and one backed by an orchestra of Cuban musicians. “I’ve played with orchestras all over the world, and it’s a very powerful experience that I’m excited to try in Havana,” he said. Acclaimed Cuban singer-songwriter Carlos Varela will also perform for fans. The trip will not be affected by recent changes in U.S.–Cuba relations. Music & Arts Live, the travel company organizing the affair, is licensed by both governments to take cultural exchanges to Cuba, and regulations for cultural exchanges are not being amended. We recently spoke with Wainwright about the trip and what fans can expect. For more information, or to purchase tickets, click here. Was “Wainwright Libre” your idea or was it something you were approached about? This is something that I was approached about, and certainly — I’ve been to Cuba a few times — I’d been thinking about a way to go back down and perform to a wider audience which is not so easy to do, both because of the political situation and also, just monetarily, it’s tricky. So this just seemed like a really unique opportunity to keep that dialogue going. And certainly now, with this shift in the political arena and hardening of views between America and Cuba, I think it’s more important than ever to maintain a sense of, you know, dignity [laughs]. When you first traveled to Cuba what was it that struck you about the place? I really love Cuban music and Cuban culture, though I’m not a wild Latin fanatic [laughs]. What egged me on in the first place was that Fidel Castro was still alive, and I thought it would be amazing to go there while he was still alive. Not that I like him or anything, but he’s such a monolithic figure, and to be in that country while he was still alive would just be surreal. And not to mention the country itself is sort of in a time warp, so I thought it would be good to check that out before it all changed after he died. So we went, and then we went twice while he was still alive because we ended up just falling in love with the people and the culture and the architecture, and, to be honest, the shift in perspective in terms of technology. Whenever we go down there you really can’t use your phone and go online or anything, and that was such an amazing release for us, living in the Western world. I remember I went down and I didn’t have my phone and I didn’t have my computer, and I read half of James Joyce’s Ulysses instead. So, there’s something about it that’s magical. You mentioned you weren’t a “Latin fanatic,” but I see you’ve gotten into the music on a more-than-superficial level. Carlos Varela will be performing as part of the travel package and I understand that he’s regarded as one of the top songwriters in the country. I feel like for most American music fans, their knowledge of Cuban music is limited to Buena Vista Social Club. Are there any other recommendations you can offer? I know Carlos — I met him last time I was there — and I think that what gives me an entrée into that world is that I am just into really great songwriting in general, and I’m very focused on being myself, and I think that’s something that Cuban music always strives for. As I said, I’m not an expert on this stuff, so I can’t really go into tremendous detail, but what I’ve garnered so far is that it’s such a mix of cultures, and histories, and instruments, and sensibilities that you just get these really unique individuals like Carlos, and people are really searching for disparate elements that make one special. They’re not as much into cookie-cutter stuff as we are up in America. So I really feel like a lot of the shows that we’re going to be offering are a wide variety of Cuban styles. The first time you went to Havana you said it was more like New York than Miami. What did you mean by that? As I said, I didn’t really know much about it at the outset and the first thing that really struck me was how massive it is — it seems way bigger than Miami, and it has these different areas and different architectural styles, starting in the the 17th century or so up until the ’50s, and they’re all prime examples of those periods. And after being there for a few days you realize that Havana really wasn’t a holiday destination only. I mean yes, there was a facet that served that purpose, but really it was a very international, vibrant, and powerful city. I see you’ll be playing two shows down there, one a solo gig and the other with an orchestra. Yeah, I’m excited. You know one has to also be realistic and realize that, going down there, it’s very fluid. You have to be prepared for turns in the road with Latin America in general [laughs]; Cuba doesn’t corner that market. So yeah, if anything, people will hear me with an orchestra with some Cuban musicians, but they’ll also get some surprises which is always good.